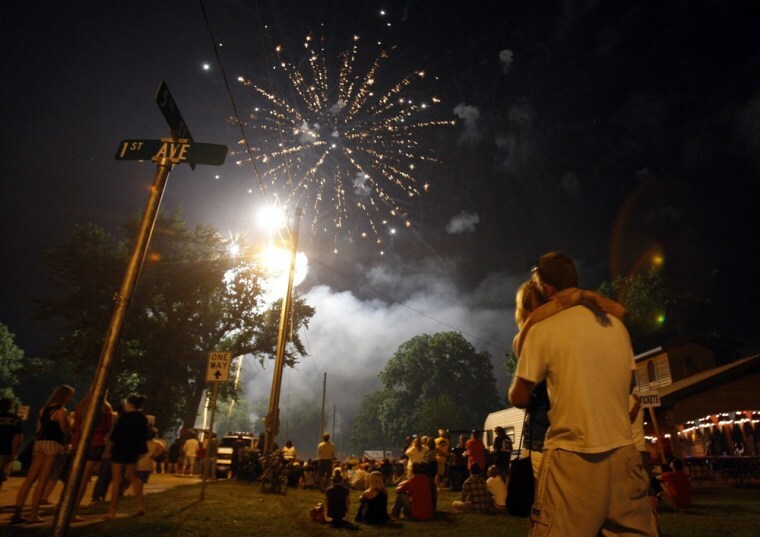 A couple kisses during the Independence Day fireworks display in Independence, Iowa July 4. 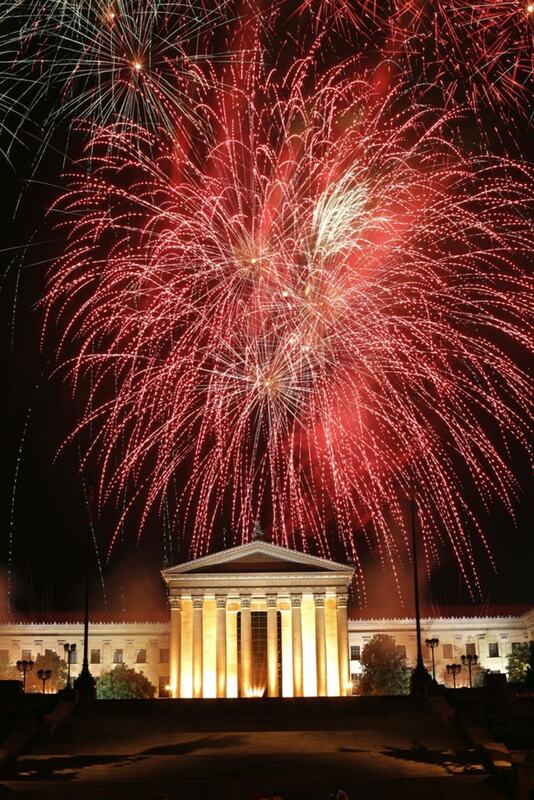 Fireworks explode over the Philadelphia Museum of Art during an Independence Day celebration Monday, July 4, in Philadelphia. 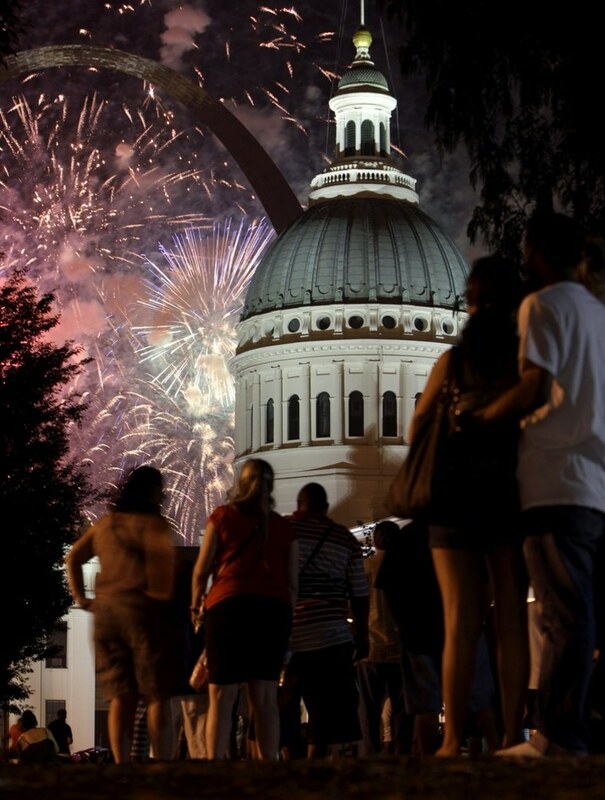 Spectators watch as fireworks light up the night sky behind the Gateway Arch and the Old Courthouse Monday, July 4, in St. Louis. 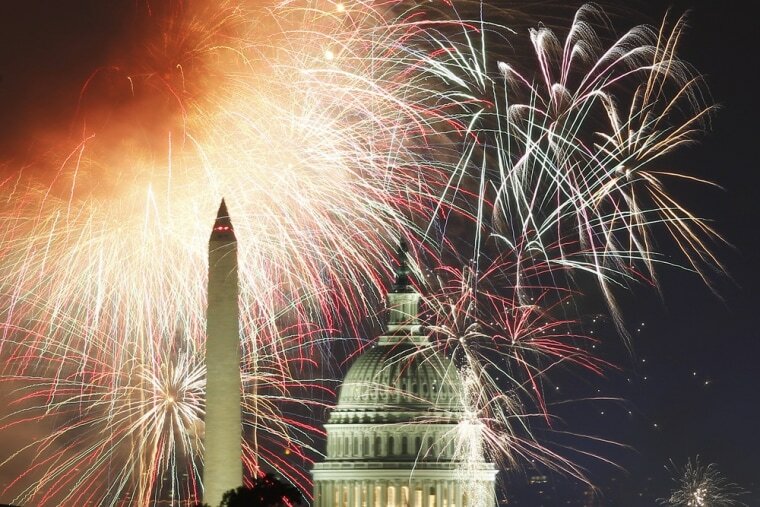 Fireworks light up the sky over the Capitol dome and the Washington Monument as the U.S. celebrates its 235th Independence Day in Washington, D.C., July 4. 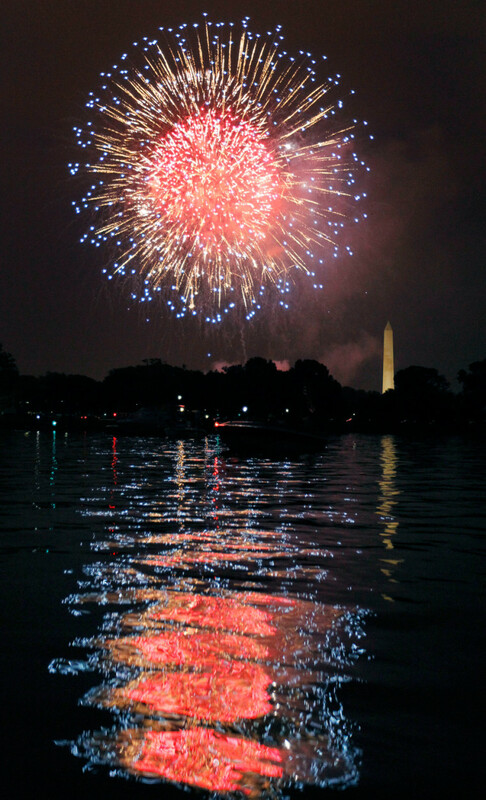 Fireworks illuminate the night sky and are reflected in the Potomac River with the Washington Monument at right on Monday, July 4, in Washington, D.C. 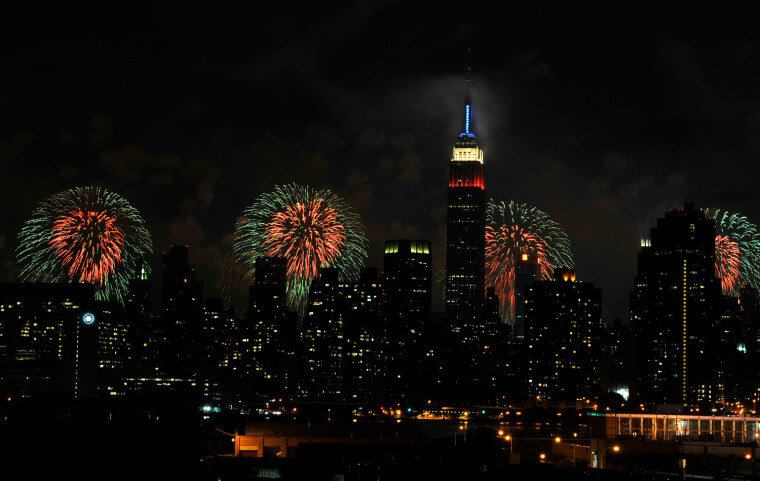 The Empire State Building, illuminated with red, white and blue lights is seen from across the East River in the Queens borough of New York, backlit by fireworks exploding over the Hudson River during the Macy's Fourth of July fireworks show on Monday, July 4, in New York. 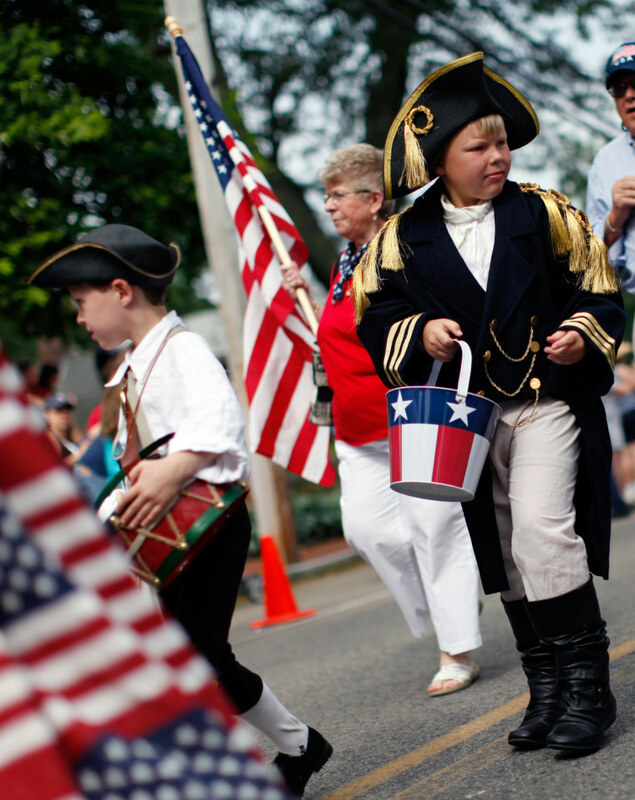 Spectators watch the annual Independence Day fireworks over the Hudson River, Monday, July 4, in New York. 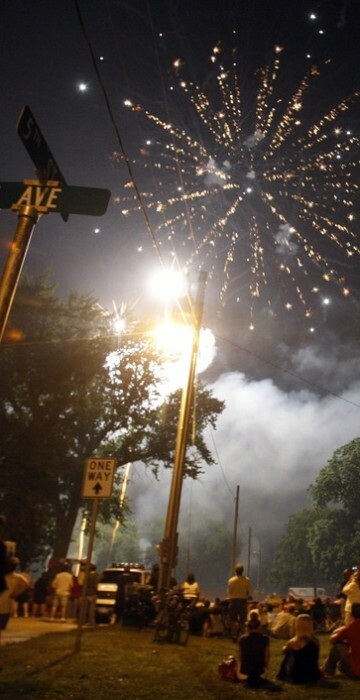 A portion of Manhattan's west side is closed to vehicular traffic, allowing pedestrians to camp out and wait for the 40,000 shells to be launched after dusk from a barge on the river. 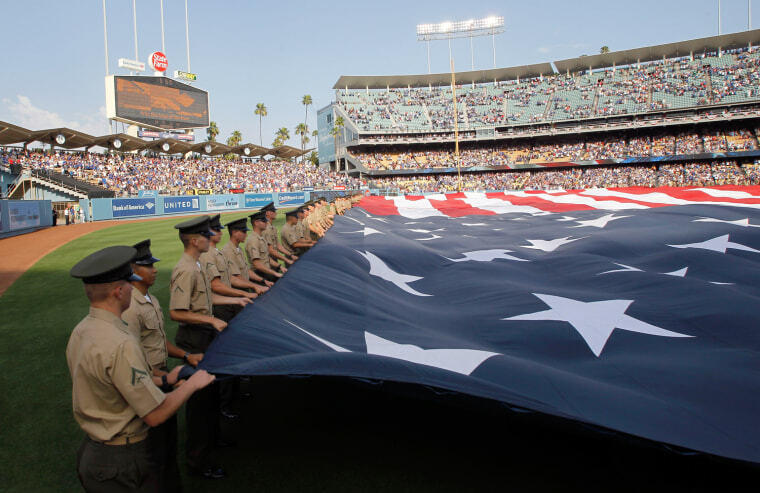 Members of the United States military hold onto a giant flag displayed for the national anthem during pre-game ceremonies prior to the New York Mets' National League baseball game against the Los Angeles Dodgers in Los Angeles, Calif., July 4. 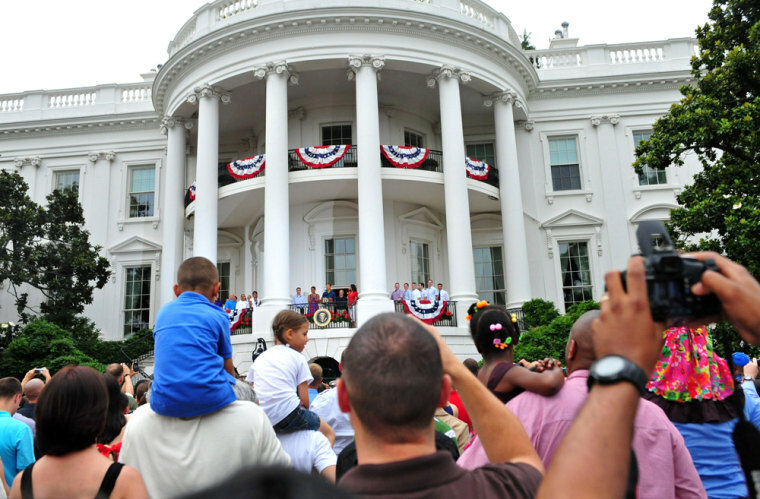 President Barack Obama, joined by first lady Michelle Obama and members of the armed services, delivers remarks at the South Lawn of the White House on July 4 in Washington. 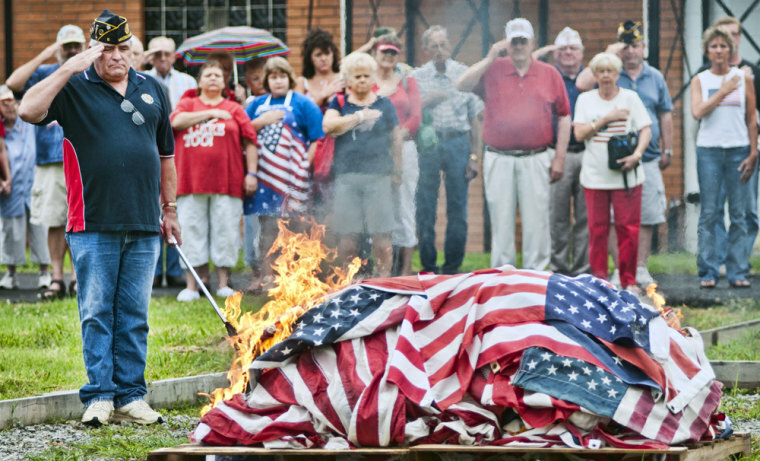 Obama hosted an Independence Day barbeque for members of the military and White House staff and their families. Air Force Tech Sgt. 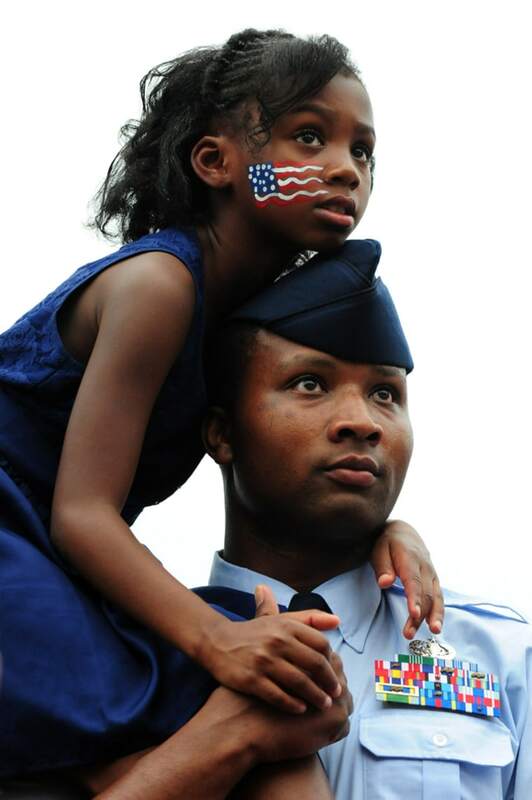 Marquis Mullins and his daughter Anya listen as President Barack Obama delivers remarks at an Independence Day barbeque. Jason Utgaard, 26 from Salt Lake City, second from left, and friends celebrate the holiday skiing Snowbird Ski Resort in Utah, dressed from head to toe in red, white and blue. 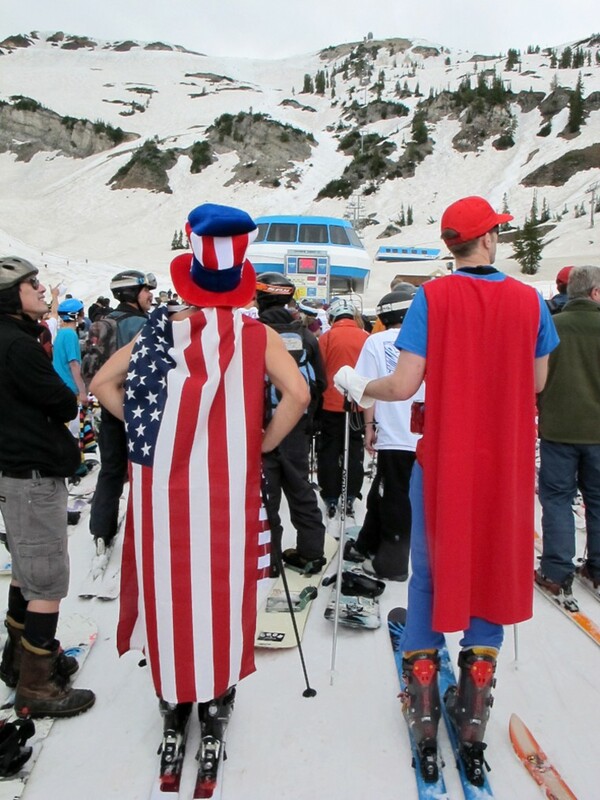 Snowbird was open for the Fourth of July for only the third time in history. 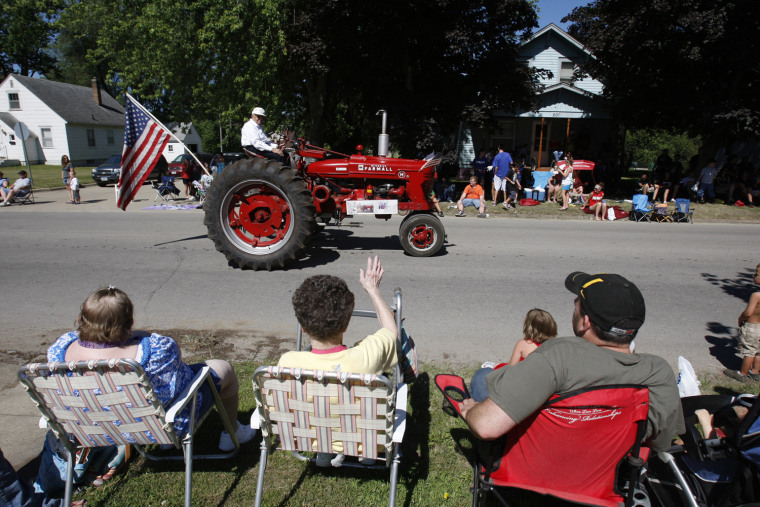 Lyle Luloff, 93, sits atop his tractor during the Independence Day Parade in Independence, Iowa. 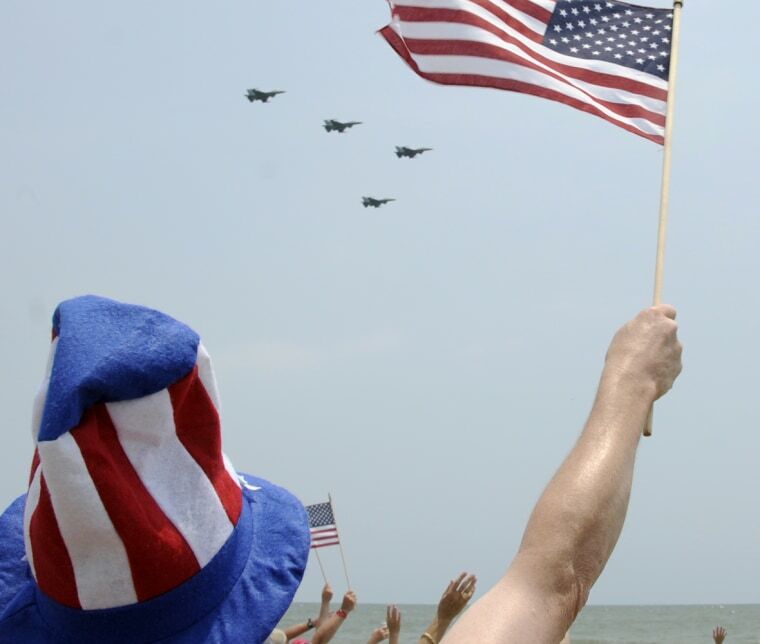 Billy Carpenter, of Greenville, S.C., waves a U.S. flag as four F-16 fighter jets from Shaw Air Force Base fly over the South Carolina coast for the Salute from fhe Shore, event at Litchfield Beach near Pawleys Island, S.C.
Children and adults march in the Barnstable Fourth of July parade in Barnstable Village, one of America's oldest settled towns founded in 1639 on Cape Cod, Mass. 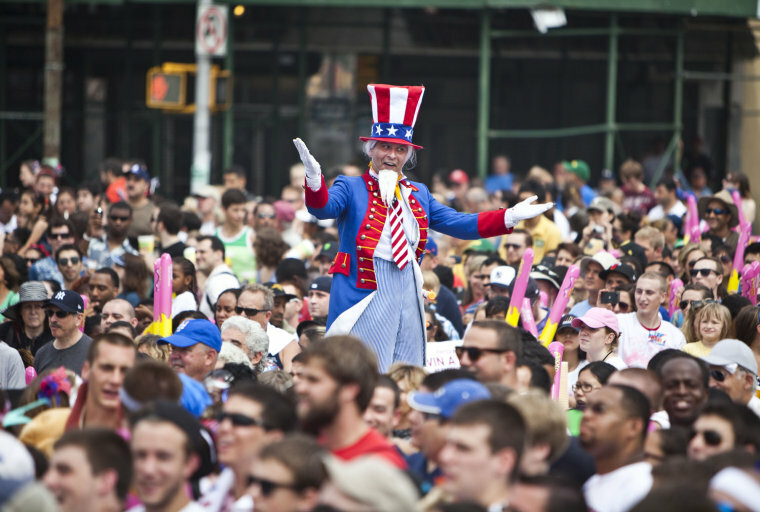 A man dressed as Uncle Sam entertains the crowd during the Nathan's Famous Fourth of July International Hot Dog Eating Contest at New York's Coney Island. Joey Chestnut won the men's competition by eating 62 hot dogs in 10 minutes; Sonya Thomas won the women's event by eating 40 hot dogs. 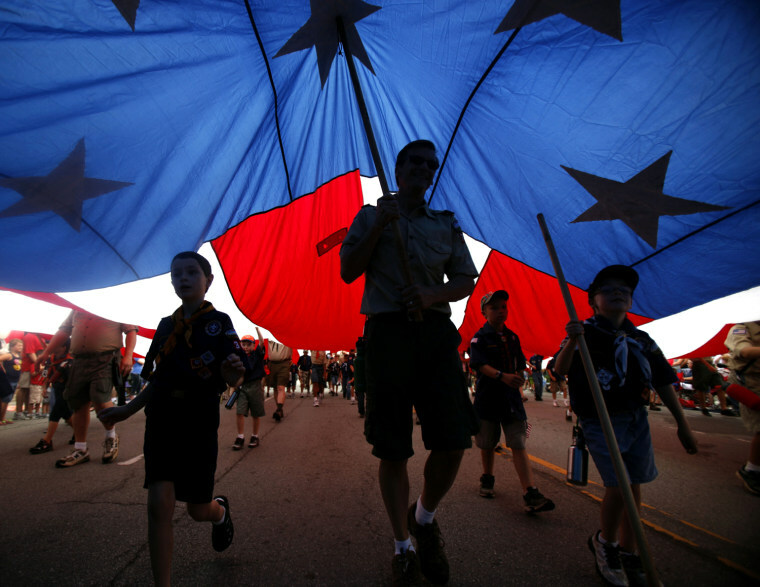 Boy Scouts of America and Cub Scout troops carry a large American flag during the LibertyFest Fourth of July parade in Edmond, Okla.
Spectators lining Nevada Way shoot water guns at passing floats during the 63rd Annual Boulder City Damboree Parade, July 4, in Boulder City, Nev. 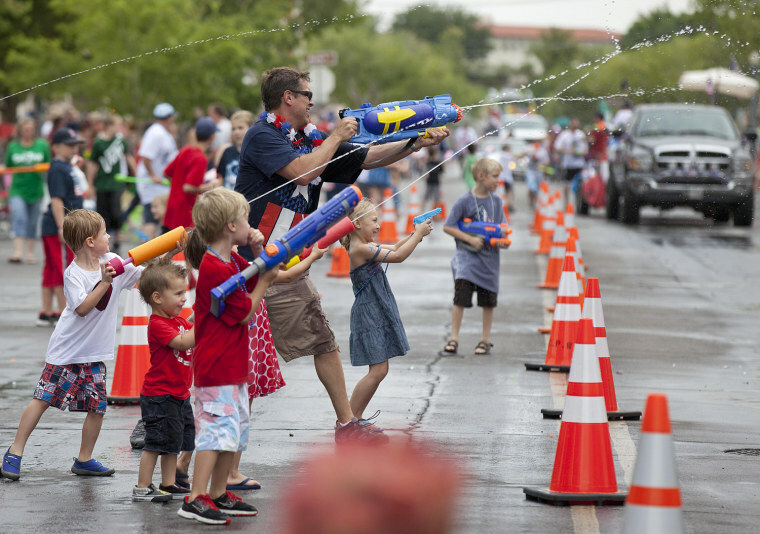 The last half of the parade entrants are called Water Entrees, making them fair game for water fights with spectators. 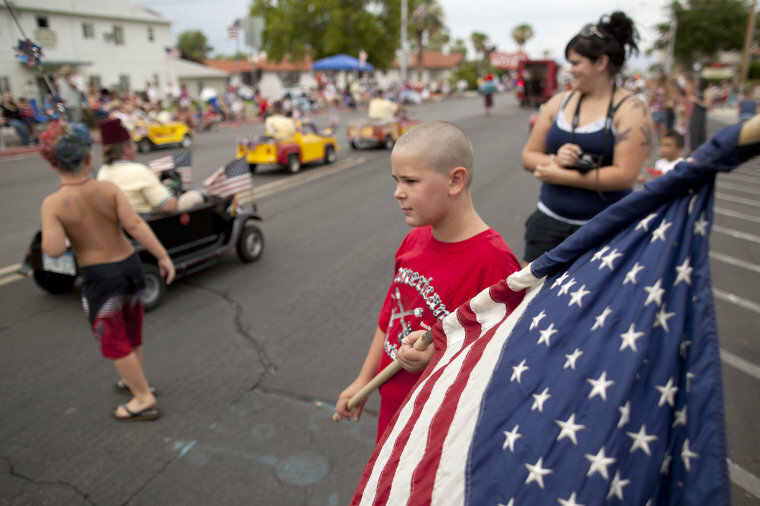 Ten-year-old Austin Kelley, right, watches as floats and other entrants roll along Nevada Way in the 63rd Annual Boulder City Damboree Parade in Boulder City, Nev.